Parrotlets are often described as large birds in small bodies. These little birds only grow to an average of 5 inches in length, but they have big personalities and a lot of energy. Parrotlets are active birds that need plenty of space to play as well as toys to provide enrichment. If your parrotlets don’t get the space and exercise they need, they won’t reach their maximum lifespan which is up to 20 years. Everila 53” Large Parrot Cage. Choosing the right cage for your parrotlets is extremely important if you want them to be happy and healthy for as long as possible. Keep reading to learn more about parrotlet care requirements and how to shop for the best bird cage for parrotlets. 5. 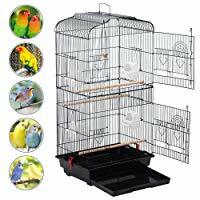 Everila 53” Large Parrot Cage. How Much Space Do Parrotlets Need? What Else Should You Include in Your Parrotlet Cage? When it comes to caring for parrotlets, you need to provide for your bird’s nutritional needs as well as his needs for a healthy, spacious living environment. These birds can be kept in pairs or in larger groups due to their social nature, but they still need human interaction on a daily basis. Parrotlets are not necessarily a high-maintenance pet, but you do have to meet some specific requirements when it comes to their care. These birds need space to fly, climb, and play as well as a healthy, balanced diet that provides for their nutritional needs. Though parrotlets are the smallest kind of parrot, they still need a great deal of space. Not only are they active birds that like to move, but they are very social as well and do best when kept in larger groups – this means you’ll need additional space. Keep reading to learn how to choose a bird cage for parrotlets. When shopping for a bird cage for parrotlets, you’ll need to consider the square footage of the cage as well as the specific dimensions. You should also think about additional factors such as the number of perches and the spacing of the bars. Minimum Cage Size – The minimum cage dimensions for a single parrotlet are 18×18 inches, and the minimum for a pair of parrotlets is 40x20x20 inches. Flocks need much larger cages. Width and Height – Parrotlets may not be large, but they are very active so they need a wide cage to permit flight and a high cage so they can have several perches to hop between. Bar Spacing – Because parrotlets are small, you should make sure the bar spacing in your cage is no more than ½ inch, so the bird doesn’t get its head stuck by accident. Perches – You’ll need at least two different perches in your parrotlet cage, or more depending how many birds you keep. The perches should be different thicknesses and made from different materials to keep the bird’s feet strong and his nails filed down. Keep reading to see our top 5 recommendations for the best bird cages for parrotlets. Parrotlets are active birds, so the bigger their cage the better. It’s always a good idea to buy the largest bird cage you can afford, but you also need to consider factors such as height, bar spacing, and additional features like a slide-out tray for easy cleaning. 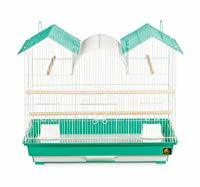 Your parrotlets deserve to live in luxury and this Prevue Pet Products Plaza Bird Cage delivers just that. It features a durable wrought-iron construction for long-lasting security for your parrotlets but comes on a rolling metal stand for convenience. It comes with a slide-out metal tray as well as an angled seed guard to funnel dropped seed and waste into the tray for easy cleaning. This cage comes with two stainless steel cups and a hardwood perch to get you started and is surprisingly affordable at just over $125. Parrotlets are a social breed that prefers to be kept in groups or pairs which means you’ll need a cage large enough to accommodate more than one bird. This Mcage Large Wrought Iron Flight Cage with Removable Stand is a good option and surprisingly affordable for the size. It made from durable wrought-iron materials with rolling wheels for maneuverability and a shelf for storage. It also features a slide-out metal tray for easy cleaning and comes with perches, metal shelves, and ladders. Parrrotlets are small birds but they are active, so they need plenty of perches to hop around on. This Yaheetech 36” Medium Portable Bird cage is ideally sized for small parrots and comes with three perches as well as a hanging swing and several feeding dishes. It is lightweight and portable for travel but still durable enough to keep your parrotlets safe. You’ll also be glad to know that it is affordably priced under $50 and comes with a slide-out tray for no-mess cleaning. Parrotlets are small birds but they are very active so they do best when they have a flight cage for recreation. If you’re looking for a temporary cage or a small daily cage to keep in addition to a separate flight cage, this Prevue Hendryx Triple Roof Bird Cage is a good option. It is affordably priced under $65 can features a unique triple roof design to add a little more vertical space for the bonus perches. It comes with two full-length perches as well as a removable grill and pull-out tray for easy cleaning. 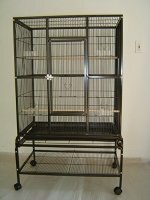 Parrotlets may not be very large, but they are active so a 53” cage like this Everila cage is a good option. It is made from carbon steel wires which are plenty durable for small birds like parrotlets, though they may bend under strong pressure. The cage also comes with a rolling metal cart for maneuverability as well as a slide-out tray for quick and easy cleaning. It also features 7 feed doors and comes with 4 feeding ups as well as two perches, making it easy to access for cleaning and feeding. The minimum recommended cage size for a single parrotlet is 18×18 inches, though it is better if you can provide extra space for your bird. Parrotlets are active birds that like to fly, so choose a cage that is longer than it is high while still providing enough vertical space to accommodate several perches at different heights. A pair of parrotlets need at least 40x20x20 inches of space. In addition to providing enough space with your parrotlet cage, you’ll also need to provide for your bird’s needs for healthy food and enrichment. Provide at least one food and water dish per pair of birds and clean them daily before refilling. You’ll need at least two perches of different size and texture as well as an assortment of toys to provide enrichment opportunities. 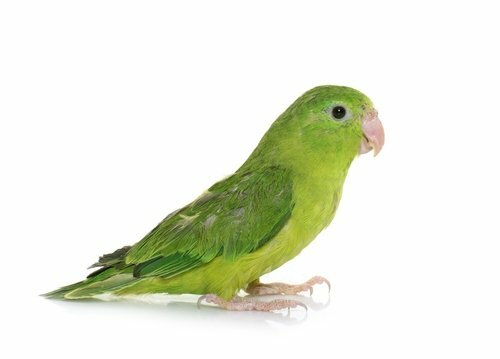 Though parrotlets may be small birds, they have big personalities and big needs for space. Your parrotlet cage should provide ample room for your birds to stretch their wings and to hop from perch to perch, getting the exercise they need to stay healthy and happy. If you’re not sure where to start shopping for a parrotlet cage, try one of our top 5 picks reviewed above!